In my life experience, young people seldom seem to practice moderation. Politicians pull the concept apart like hyenas over a fresh kill. I look at the stunts I pulled as a teenager – especially when it came to alcohol – and I have to shake my head in wonderment. As the years slipped by like a thief in the night, I became more aware of the wisdom in moderation for all things. Quick disclaimer; any age can go overboard on something, but experience usually teaches us our limits. I’m not talking about addictions right now. Obviously that’s a side-bar to consider. I’m talking about ordinary people who get carried away with issues or personal challenges. My favorite reflection on moderation comes from Ralph Waldo Emerson who said, “Moderation in all things, especially moderation.” You can’t have too much fun! Here’s a deadly case of no moderation: A teenager in Georgia consumed two gallons of water and two gallons of Gatorade after football practice, and was so over-hydrated that his body's electrolytes were thrown off-balance, causing massive swelling in his brain. Five days later, on Sunday night, he was taken off the ventilator. True happiness springs from moderation Johann Wolfgang von Goethe claimed. I’m not sure I would go that far, but moderation does makes sense to me. After comparing my drinking habits in my youth (where I’d pound the booze down until I either got sick or passed out) to now, I feel like I learned something about moderation. When it comes to social issues, moderation is a political football kicked around the public arena. Age plays no part in how extreme people can be. In this context, moderation is not always looked upon as a good thing. Take TV shows on cooking. Julia Child has given away to “Kitchen Wars” and other reality shows that manage to take a serene activity like cooking and turn it into a violent experience where chef’s scream at their helpers. 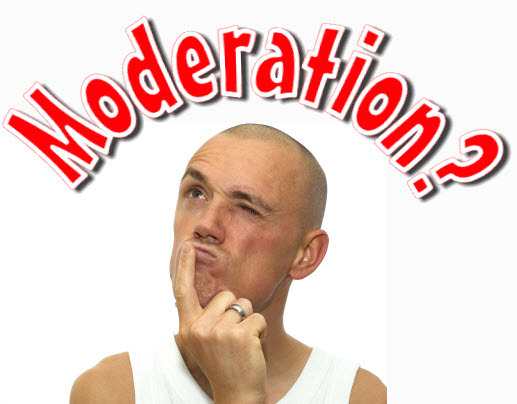 I believe moderation has it’s place in our lives, depending upon the circumstances. Throw some common sense into the mix, add a dash of experience, a tablespoon of good advise, and I think you have the map to a happy and safe life. Wow! A Million Views and the Years Not Over!